"What does it mean to be completely confident in your own skin?" I remembered very vividly, that Dr Rachel Ho once asked on her IG story, about what would make us confident enough to show our bare faces to the world, without any makeup on. That question stuck with me for a long time. Honestly, I think with the current society's high standard of beauty, it's almost a basic form of respect to have at least some coverage on our faces and to only show them our very best selves. For me, I'd only be completely confident to go bare face and be comfortable in my own skin if I have a blemish-free skin without any acne/dark spots. I'd want to not just have an even skin tone, but also an even skin texture, with no comedones lying around and less visible pores. Now that seems like a lot to ask for, right? But with the right hands, I'm sure these will eventually be achievable. My journey with La Clinic started in October 2017 when I first visited Dr Rachel Ho to examine my face and skin condition. We talked about my skin concerns, including my history of eczema and skin sensitivity. She was cautious with the treatment she recommended to me, and we decided to go for Q-switch laser, coupled with Chemical Peel on alternating sessions. Throughout my monthly sessions, she always made sure I felt comfortable and that my skin wasn't reacting adversely to any of the treatments before proceeding. And after 10 months, I assure that these treatments did not in any way triggered my eczema and it was safe even for my very sensitive skin. Now, enough of talking, here are some pictures! My right profile — the first picture was taken after my first session. As you can see, the redness in my skin calmed down quite significantly and I was able to slowly reduce the amount of foundation I use on my skin. Each treatment lasts less than 30 minutes and I was able to apply makeup right away with no downtime at all. Of course, the results will take time to show and require a long-term commitment. But good things come to those who wait right? Q-switch laser technology is a multi-wavelength aesthetic medical laser that is suitable to treat a broad range of indications on all skin types. Its versatility makes it one of the most effective treatment options available for both repairing and rejuvenation of the skin. In addition, treatment is comfortable and there is no downtime. Its benefits include reducing pore size, acne and comedones. It can also help improve skin texture by reducing scarring and pigmentation. Dr Rachel Ho has also made a post about Q-switch laser, to know if it's what you're looking for, find out here. My left profile — the blemishes on my cheeks has reduced, but I had new spots on my chin and also some scars from eczema at the side of my mouth (in the second picture) which has faded after two sessions of treatment (as seen in the third picture). Before I started my session with La Clinic, the blemishes on my cheeks were more visible, my skin tone was obviously very uneven. My skin reacted very well to the first three sessions I had, as seen from the increasingly-even skin tone. Some of my old scars have also faded from the Chemical Peel treatments. Gone are the days whereby chemical peels intensely slough your entire face off, leaving you red and under house arrest. It is one of the most popular, fuss-free, non-invasive treatments due to its comfort level and instant results. Commonly known as the “lunchtime peel”, patients walk out of the clinic with radiant looking skin. It helps to improve skin imperfections by reducing fine lines and wrinkles, as well as acne and comedones. It also reduces pigmentation. Of course, the results so far don't seem at all shocking, but trust me, keep reading. Honestly, I was very pleased with the results, until my skin started to break out in April.. I was on a TCM oral medication for my eczema starting from August last year which, I suspected had steroids in it. That affected my hormones and caused me to break out really badly. I've since stopped the medication after realising the side effect (one of it being steroid acne). My right profile — on the right is an image taken when my condition was the most serious. There were very obvious red bumpy spots around my cheeks that can't even be concealed with makeup. Dr Rachel Ho was, however, very patient with me. She constantly reminded me not to give up and that the treatment will eventually relieve these conditions and fade away the scars. This is, after all, a process, not an end result. After four months, my skin looks radiant! Not from the redness of blemishes but a glow from within that acts as a natural blush. 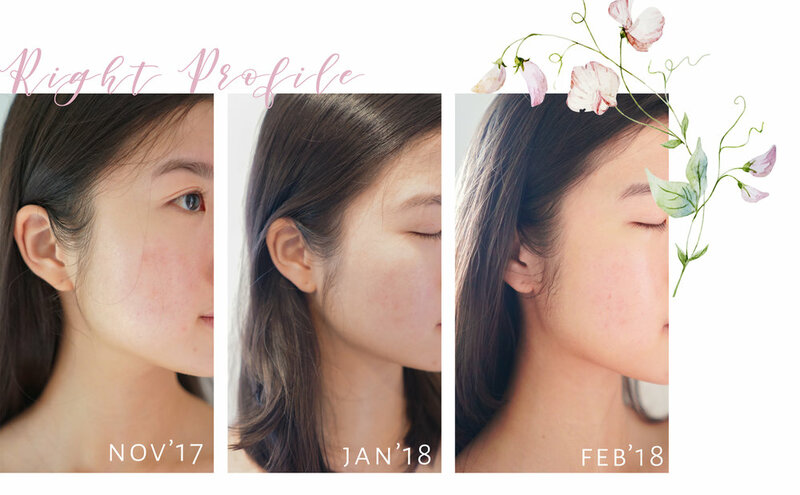 My left profile — similarly, on the left side of my face, large spots have diminished and it now looks more calm, less irritated and sensitive. I must say the biggest take away from all my sessions is that I now no longer need to use foundation (I used to use BB cushion). Now I just have to apply concealer on specific spots, blend it in and I'm good to go! I've learnt that less is definitely more, and the more you let your skin breathe, the faster it'll heal itself. My aim is to one day stop relying on makeup and be confident enough to go out without any concealer. With the results I'm seeing thus far, I believe this is certainly achievable. A huge shoutout to Dr Rachel Ho who has been so kind and patient with me. If you're looking to improve your complexion and looks in any way, visit La Clinic and I trust that you'd be in good hands. I mean, she's a living example of what she does and her face is just flawless!